With temperatures and humidity clashing near Los Angeles, this week's Southern California heat wave found Gerry Davis during a day game at Angel Stadium, the veteran MLB umpire and crew chief leaving his afternoon assignment in Anaheim due to dizziness. Gerry Davis left early during a hot SoCal day. 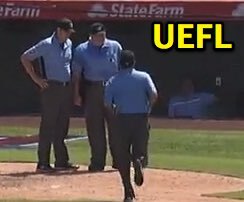 At the conclusion of the 6th inning of Thursday's White Sox-Angels game, HP Umpire Davis exited the field and was replaced by 2B Pat Hoberg, leaving 1B Umpire Ryan Additon and 3B Umpire Brian Knight in the field for the contest's remaining two-and-a-half innings (the home team won). How hot was it? Officially listed in the box score as 84-degrees at first pitch, temperatures at Angel Stadium climbed toward 90-degrees (Fahrenheit) with humidity upwards of 60%, but with sunny conditions, the field must have been so hot that Davis was seen wearing MLB umpiring's "hot weather" blue polo along with a wet towel on his neck—a look rarely seen on the 37-year big league vet. Sidebar: We almost lost a second umpire in this game. Coming out of the tunnel, replacement plate umpire Hoberg hit his head on the low doorway/bar headed to the playing field. Thank goodness it's padded.